Amazing isn’t it? The productions team has came a long way since the giant bow, 75 ft tall jacket, merry-go-round… to this. And they must have spent a lot of $$$ to make it work. But I have to agree with him that this is truly epic. 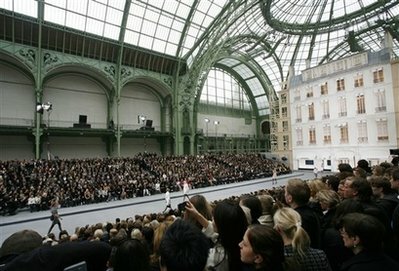 Plus, the clothes do match up to the grand stage, very couture-like and classic Chanel. 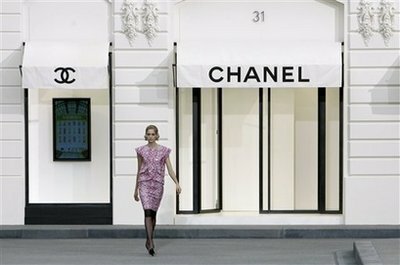 Karl has been on a roll lately, if you want to ignore that horrid Fendi Spring 09 collection, from his couture Fall 08′ till now he has been as magnificent as ever, don’t you agree? H needs the collection to sell so he can pay for that show. That set is epic. Must have costs a forune, and it really makes an impact. 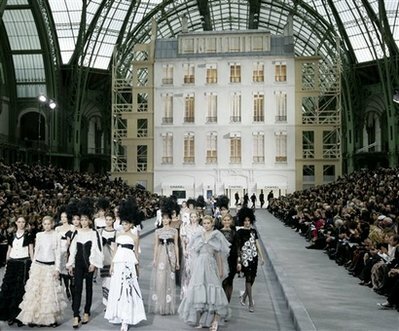 Love the set, so quintessentially Chanel it’s amazing. I’d buy that shopper, if the price wasn’t staggering like it most likely will be! 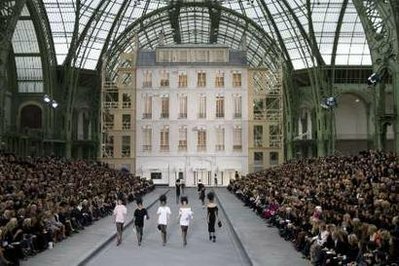 The set looks unfinished… But that has to be his best RTW in years and years! Sooo solid it breaks my heart, sorta.